Like father, like son. Ten-year-old cutie Romeo Beckham hit Santa Monica yesterday to shop for a new Halloween costume, but it was the neck tattoo he was sporting that really caught our attention. The tattoo on Romeo’s neck – which is fake, by the way – says “Harper,” and is not only a super-cute tribute to his one-year-old sister, but is also an exact replica of David Beckham’s chest tat. Beckham got his Harper tattoo inked on the upper part of his chest shortly after his little girl was born last year, and Romeo obviously wants to be just like his dad. Check out Romeo Beckham’s “Harper” neck tattoo! Not only does David Beckham’s son follow in his footsteps when it comes to playing soccer, but 10-year-old Romeo Beckham also apparently admires his dad’s numerous body tattoos. While shopping for Halloween costumes with mother, Victoria Beckham, and siblings Brooklyn (13), Cruz (7) and Harper (1), in Santa Monica, California yesterday, Romeo showed off an exact replica of David’s “Harper” tattoo in the same spot on his collarbone. Don’t worry, Romeo’s Harper tat is fake, but the 10-year-old has shown interest in getting his own tattoos when he’s old enough. David Beckham’s proud papa tribute to one-year-old Harper is super cute, and the ink is even sweeter on Romeo, who plays the role of doting big brother rather well. Maybe when he hits 18, Romeo Beckham will get tats in honor of his entire family, like dad David and mom Victoria have. 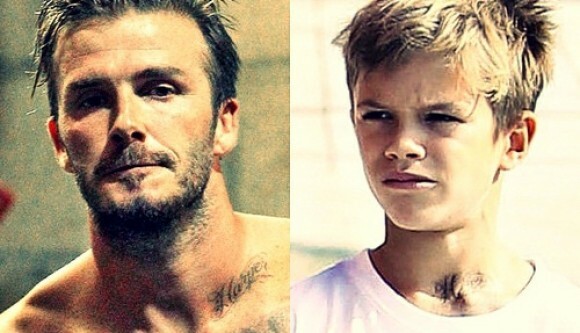 Romeo Beckham’s fake neck tattoo is identical in design to David’s tattoo on his collarbone, which reads “Harper” in scrolling script letters. The international soccer star got the ink shortly after his first and only daughter, Harper, was born in July 2011, but his little girl isn’t the only family member immortalized in a David Beckham tattoo. Following the birth of Brooklyn, Cruz and Romeo, David Beckham got each of their names inked on his back in matching Gothic text. The most significant tattoo David Beckham has on his back is a large guardian angel, and his boys’ names are inked above and below the angel tattoo. Beckham also has an intricate tattoo on his chest that features Jesus being lifted up by three cherubs, which represent his three sons. “I wasn’t planning on getting another tattoo – I’ve had a lot done – but I heard all these great things about legendary artist Mark Mahoney,” said Beckham in reference to his Jesus chest tattoo. Beckham’s Kids Want Their Own Tattoos! If you’re wondering what made Romeo ask for a temporary tattoo replica of his dad’s Harper tat, Beckham himself will tell you that his 10-year-old is already interested in getting some ink of his own when he gets a little older. How can you blame him with a dad that sports dozens and dozens of tattoos all over his body? Even Beckham’s wife Victoria has several tattoos inked on her body, all of which are in honor of her kids and husband. During an appearance on the Today show, Beckham revealed that his sons have expressed an interest in getting inked, just like their celebrity parents. “One of them said to be recently: ‘How old do I have to be before I get my first tattoo?’ I was like, ‘A lot older than you are now!’” Beckham can play coy, but we’re sure that when the time comes, he’ll be supportive of his kids’ desire to get inked. In fact, he may be right there beside them, getting some new tats of his own!